In I Corinthians 15:58, the Apostle Paul writes, “Therefore my beloved brethren, be ye steadfast, unmovable, always abounding in the work of the Lord, for as much as ye know that your labour is not in vain in the Lord.” Peter tells us, “Wherefore, beloved, seeing that ye look for such things, be diligent that ye may be found of him in peace, without spot, and blameless” (2 Peter 3:14). And wise Solomon points out, “Seest thou a man diligent in his business? He shall stand before kings” (Proverbs 22:29). Determined people begin their success where most others quit. We Christians need to be known as people of persistence and endurance. One person with commitment, persistence, and endurance will accomplish more than a thousand people with interest alone. In Hebrews 12:1 NIV we read: “Therefore, since we are surrounded by such a great cloud of witnesses, let us throw off everything that hinders and the sin that so easily entangles, and let us run with perseverance the race marked out for us.” The more diligently we work, the harder it is to quit. Determination is a habit—so is quitting. Don’t be concerned about how much money, ability, or equipment you are starting with; just begin with a million dollars’ worth of determination. Remember: It’s not what you have; it’s what you do with what you have that makes all the difference. Many people eagerly begin “the good fight of faith,” but they forget to add patience, persistence, and endurance to their enthusiasm. Josh Billings said, “Consider the postage stamp. Its usefulness consists in its ability to stick to something until it gets there.” You and I should be known as “postage stamp” Christians. In the Far East the people plant a tree called the Chinese bamboo. During the first four years, they water and fertilize the plant with seemingly little or no results. Then the fifth year, they again apply water and fertilizer—and in five weeks’ time the tree grows ninety feet in height! The obvious question is whether the Chinese bamboo tree grew ninety feet in five weeks or five years? The answer is that it grew ninety feet in five years. If at any time during those five years the people would have stopped watering and fertilizing the tree, it would have died. Many times, our dreams and plans appear not to be succeeding. We are tempted to give up and quit trying. Instead, we need to continue to water and fertilize those dreams, nurturing the seeds of the vision God has placed within us; because we know that if we do not quit, if we display perseverance and endurance, we will also reap a harvest. Charles Haddon Spurgeon said, “By perseverance the snail reached the ark.” We need to be like that snail. Winston Churchill said, “The nose of the bulldog is slanted backwards so he can continue to breath without letting go.” God tells us in His Word to not be weary in well doing because if we faint not, in due season we will reap a harvest! Our revival services and evangelistic crusades across America and around the world. Our weekly Revival Fires Television Broadcast. The continued distribution of the Truth for Youth Bibles to teenagers in America. The continued distribution of Bibles to Russian public school students and Russian soldiers. Remember to send your prayer requests and we will pray for you and your needs too. 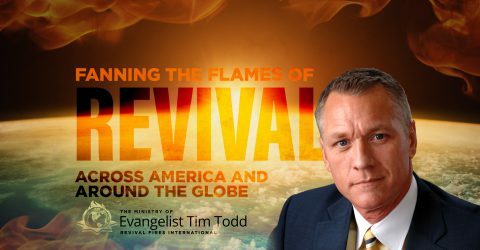 Please prayerfully consider giving a tax deductible financial gift to support the powerfully anointed ministry outreaches of Revival Fires International.